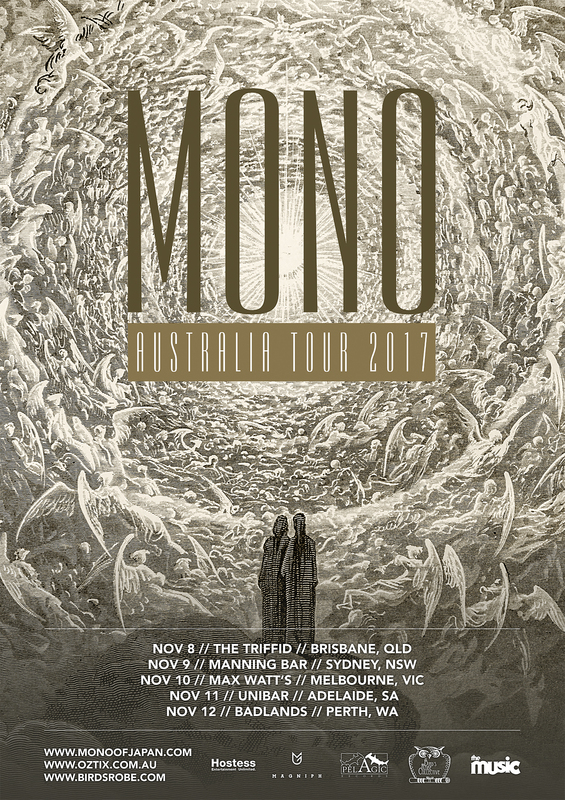 Japanese instrumental rock outfit MONO are returning to Australian shores this November in a tour presented by Bird’s Robe and TheMusic.com.au. In celebration of ten years since their debut visit to Australia, the band will visit Adelaide for the first time EVER in their history, as well as returning to Brisbane, Sydney, Melbourne & Perth. Ten years on from their debut Australian tour, this visit follows their 2016 album “Requiem for Hell” and will feature the band playing music that spans their entire catalogue across a close to two hour show. MONO was originally formed in 1999 – their unique approach of blending orchestral arrangements and shoegaze guitar noise in their music has been held in extremely high regard; so much so, that the band’s musicianship was praised by British Magazine NME: “This is music for the Gods”. One of the most monumental live memories of the band was a special set of shows with a 23-piece orchestra in New York, Tokyo, London and Melbourne. Their annual world tour consists of around 150 shows. The band has now visited over 55 countries and proudly holds the stake of being one of the most internationally successful bands in Japan. Among their fans, they are revered as one of the best live bands in rock. After releasing 10 successful albums including a live album with New York orchestra, the band received the highly regarded award “The Marshall Hawkins Awards: Best Musical Score – Featurette” from the Idyllwild International Festival of Cinema for their collaborative short film “Where We Begin” in 2015. In 2016, the band recorded their 9th album “Requiem For Hell” with Steve Albini at Electrical Audio, Chicago and was released worldwide on Oct 14, 2016. The album was accompanied by a feature documentary documenting the band’s history through to the current day. Having cemented their place amongst their post-rock and shoegaze contemporaries such as Explosions in the Sky, Sigur Ros, My Bloody Valentine and Mogwai, MONO are nonetheless peerless in terms of their incendiary live performances. Returning once again to our shores, this tour is a very special celebration of MONO’s affinity with Australia, the scene of some of their greatest shows. MONO – Journey Through Hell (Official Documentary )– featuring behind the scenes clips, live clips, interviews w/ Steve Albini, Jeremy DeVine/Temporary Residence, Susan Voelz and Todd Trainer/Shellac).